This darling white cotton blend batiste vintage style slip dress is made by Sarah Louise, a top British designer of beautiful baby garments. 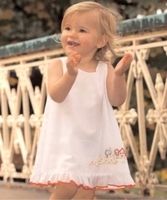 Made in simple slip style, the dress is sweetly hand embroidered with little chicks. The bottom ruffle is trimmed in red and typical of Sarah Louise design, the dress is finished with an attached under slip. It closes in the back with small shell buttons. Just darling for any summer occasion! Perfect for beach pictures, outdoor portraits, or parties!